School Safety: Locks on Classroom Doors | Metro Lock & Safe Inc.
Posted on August 27th, 2014 by Metro Lock & Safe Inc.
Of course the case for installing locks in Phoenix classrooms is an obvious one. In light of the many school shootings in the last two decades it is important to minimalism access to children. 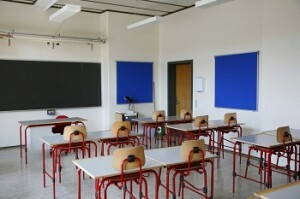 The best way to cut off access is by locking classroom doors the moment a threat is detected. Creating this barrier works to keep a rampaging student or other person with ill intentions from causing harm throughout a school. One major argument being thrown out against locking classroom doors is that there could be a threat from the inside. In a case reported by the Los Angeles Times, a third-grade teacher preformed “lewd acts against students” in a locked classroom. The result was a call for classroom doors to be left open. The safety of children could be compromised inside or outside a classroom door. That is why it may be a good solution to install locking doors where the lock is released when opened from inside. Many people have seen this style of lock on car doors. A door is locked and no one can open it from the outside, however the door still opens for the passengers without the needing to be unlocked. These locks are the best bet for school safety. They will not inhibit children from getting out of a room, in the case of a fire or other emergency, but they will keep unwanted people from getting in. It is important that these locks are accessible from the inside and do not require a key to lock them. In the case of a lockdown, anyone inside a classroom should be able to lock the door. Likewise anyone should be able to open it from the inside simply by turning the handle.